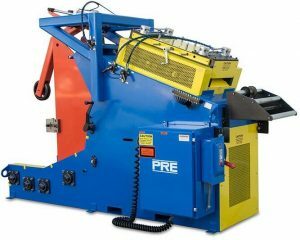 Coil Cradles and Coil Cradle/Straightener Combinations - Production Resources, Inc. These machines are ideal for controlling heavy gauge and high tensile coils. The machines feature heavy duty steel construction, self-centering crank adjustable center plates, hardened cradle rolls with heavy-duty bearings, and a variety of loop controls. Many safety and efficiency options are also available. Primo Coil Cradle/Straighteners are built to give long life at low cost. All models are standard with self-centering adjustable inside plates for easy loading. Available in 2,000, 3,000 and 6,000 lb. capacities accepting stock up to 36” width. 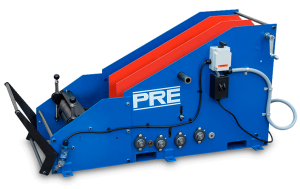 Heavy-Duty Coil Cradle Straightener combinations handle coil widths to 60” and material thickness to .300”. Standard coil weight capacities are 6,000, 10,000, and 20,000 lb.